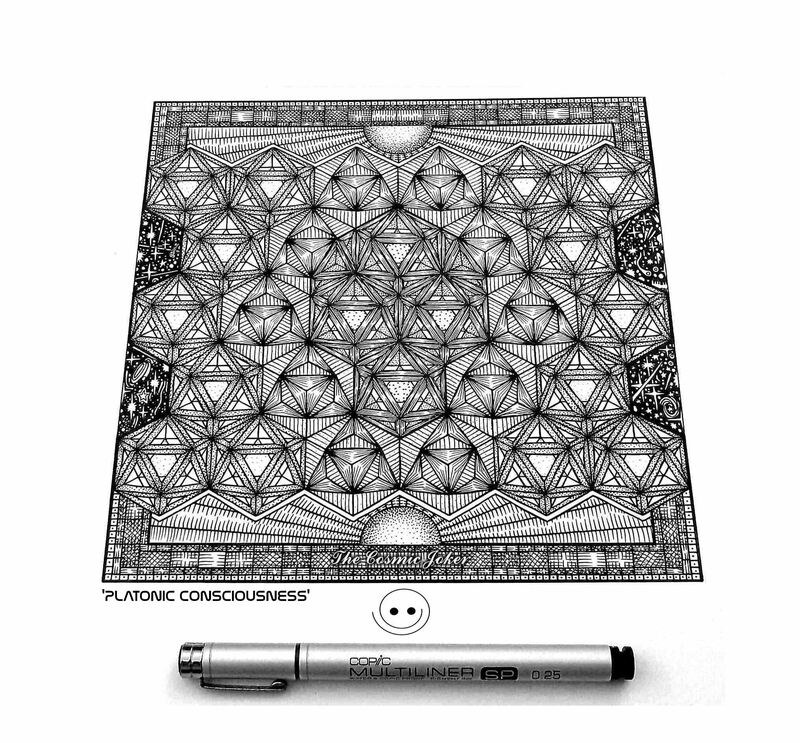 sacred geometry art – The Art of Affecting Consciousness. 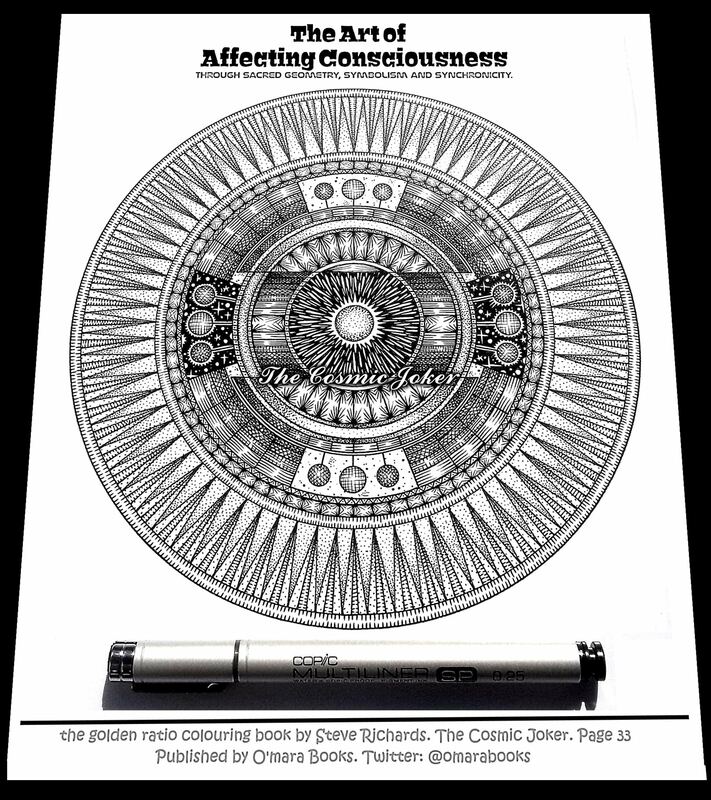 The Art of Affecting Consciousness. ” Shining brightly”. A tribute to Una Odonohue. Another mum lost but never forgotten. ❤ For Gene, Ann, Maise, Sharon, Karl, Eileen. 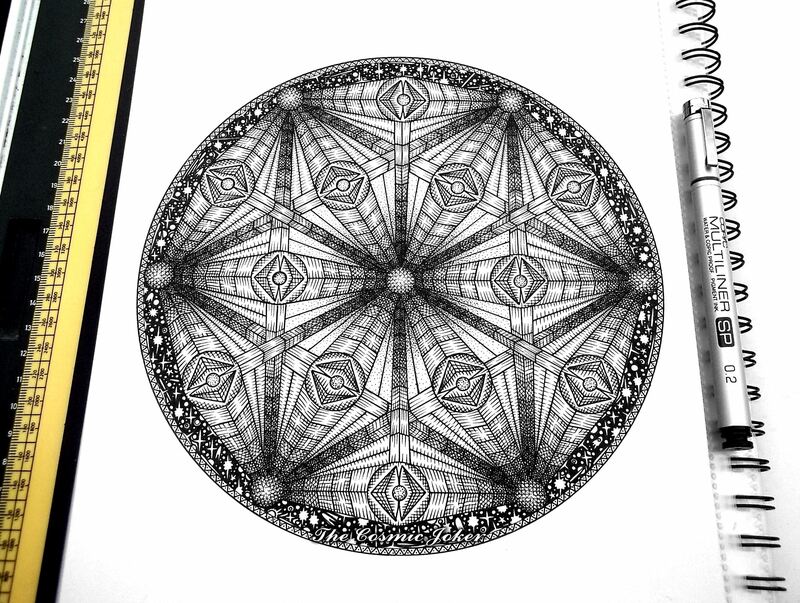 The sacred geometry, the symbolism and the synchronicity are all there for those who can see it. These are the calendars you are looking for. Another year of creativity from Land/Sand Artist Marc Treanor. He’s a legend. Check him out… SandCircles. Never imagined I’d see my art created in this way. Such an honour. There’s a great video of it’s creation on youtube. Inspired by this plate which my mum had made to celebrate my birth, I was fascinated that you could include information in artwork. So when I realized I could draw I decided to evolve the idea a little and create some personalized artwork. Every time I’m commissioned to do one, the design evolves a little. There are 2 versions. A 200mm on A3 paper and a 300mm on A2 paper. It’s entirely up-to you how much or little information you would like presented. Including hidden messages. It’s no problem if for example you don’t know your weight at birth or time. As I draw each one from a blank piece of paper I can be flexible concerning what info goes into the picture. Each design is unique although you have a good idea of what it will look like from my previous encirclopedia. 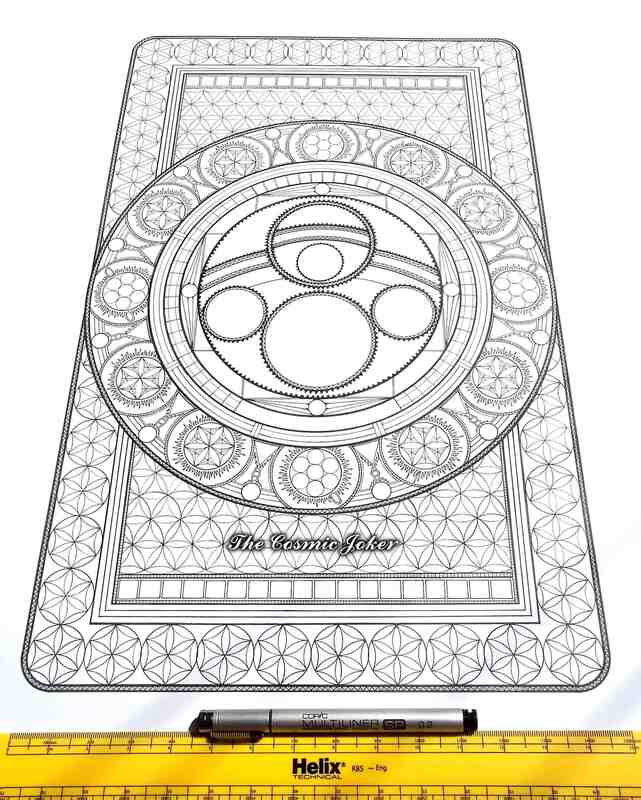 A 200mm X 200mm Encirclopedia can be completed and dispatched within a week. (A 300mm X 300mm about 2 weeks). An experimental 380mm Solar System Encirclopedia. My compass is pushed to the max. This is the latest 300MM Encirclopedia finished this week. (June 2017). And this is the one I am currently working on. A 300MM encirclopedia set with a 485MM Golden rectangle. If you like to commission one please get in touch. I have a new book out! 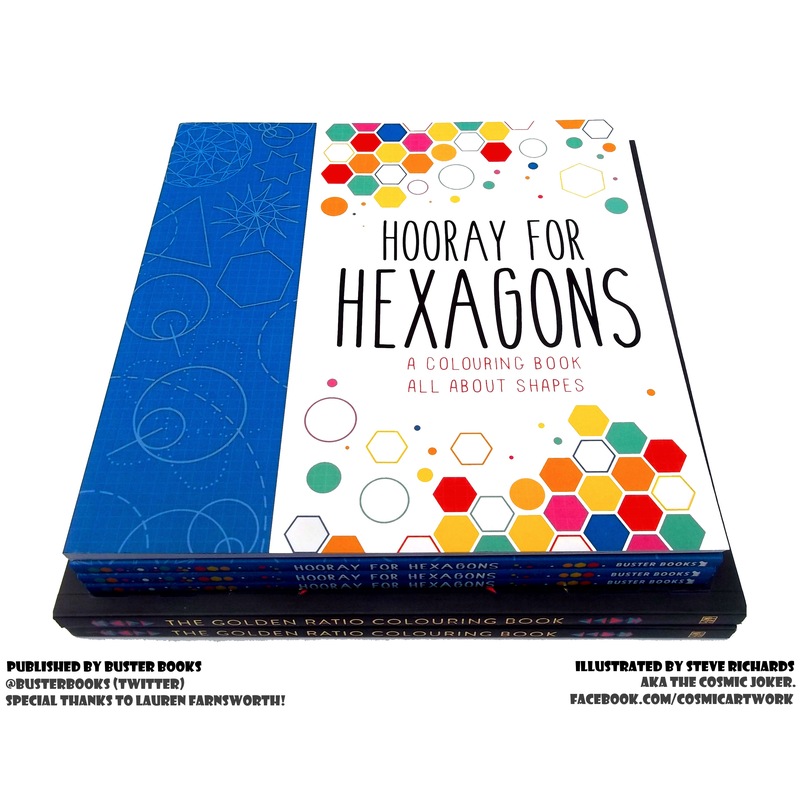 “Hooray for Hexagons”. Including circles, cardioids, spirals, fractals, impossible objects, mandalas, tessellations, parabolic curves, and even our friends the hypotrochoids! 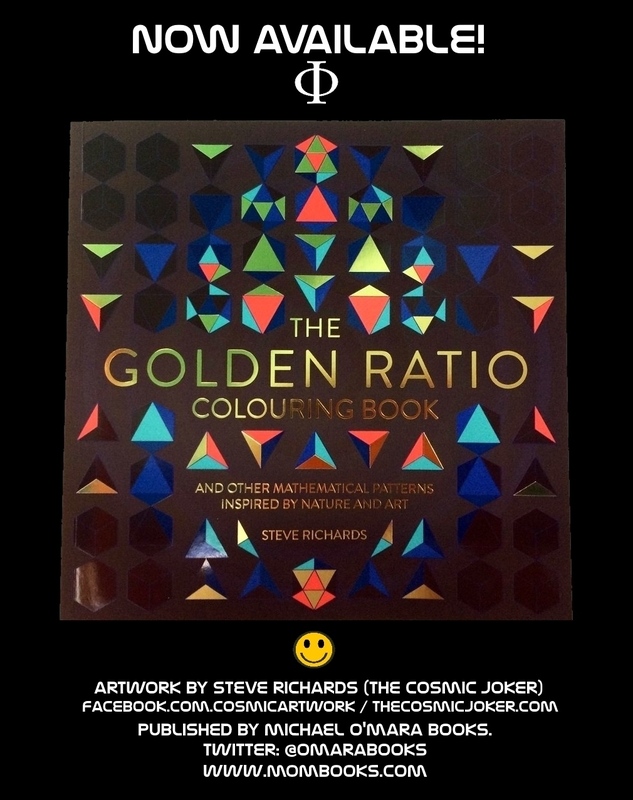 These are some of the artworks I have produced so far from ‘The Golden Ratio Colouring Book’. When I was producing the images for the book (seems like a long time ago now) it was so hard not to start shading them in, so now I get to make some of my favourites shine! Original artwork from the book. 230mm X 230mm On A3 paper. I’m so proud of this picture. 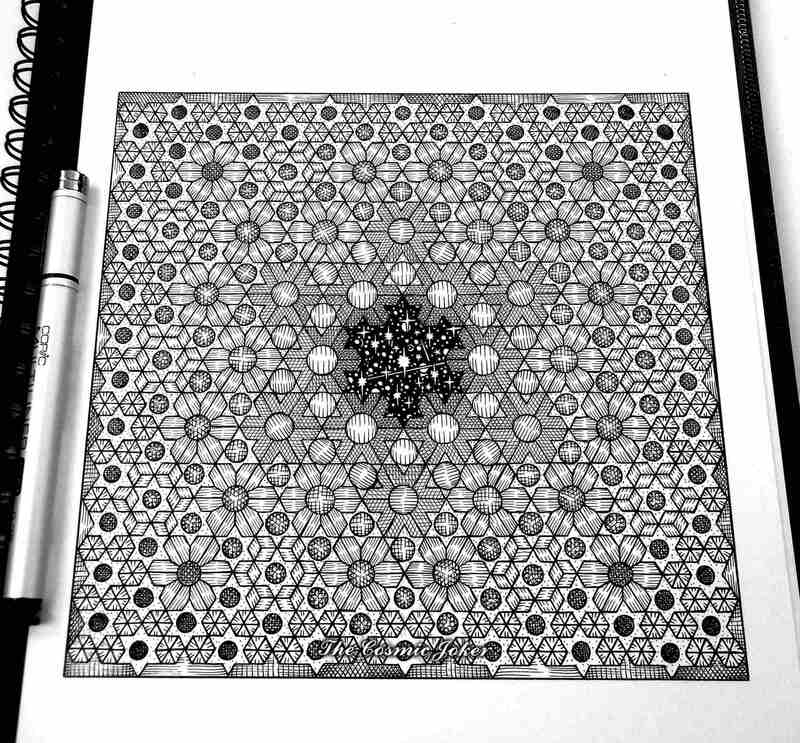 When I started drawing it, from the centre out, and then created the patterns, I almost couldn’t believe how it all came together. It almost drew itself. One piece of paper and one black pen! In my mind this one above is a Galaxy where every living, life-giving, Sun within it, is connected and conscious and able to communicate with one another at the speed of light, just happy to warm any passing rock that should come their way. 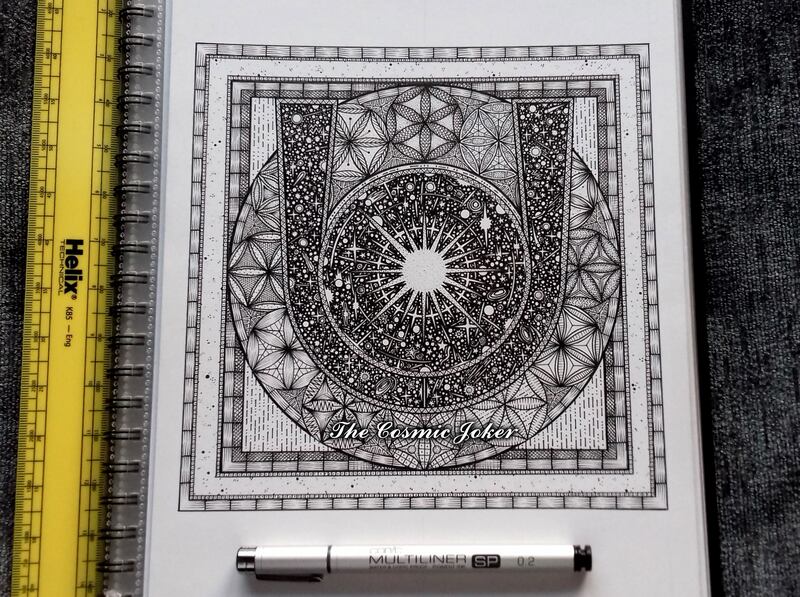 If you would like to buy a copy of the colouring book here are your amazon links. 🙂 U.S.edition / U.K. edition. Thankyou to everyone at Michael O’Mara books for making it happen! Recently finished commission for Francisco. 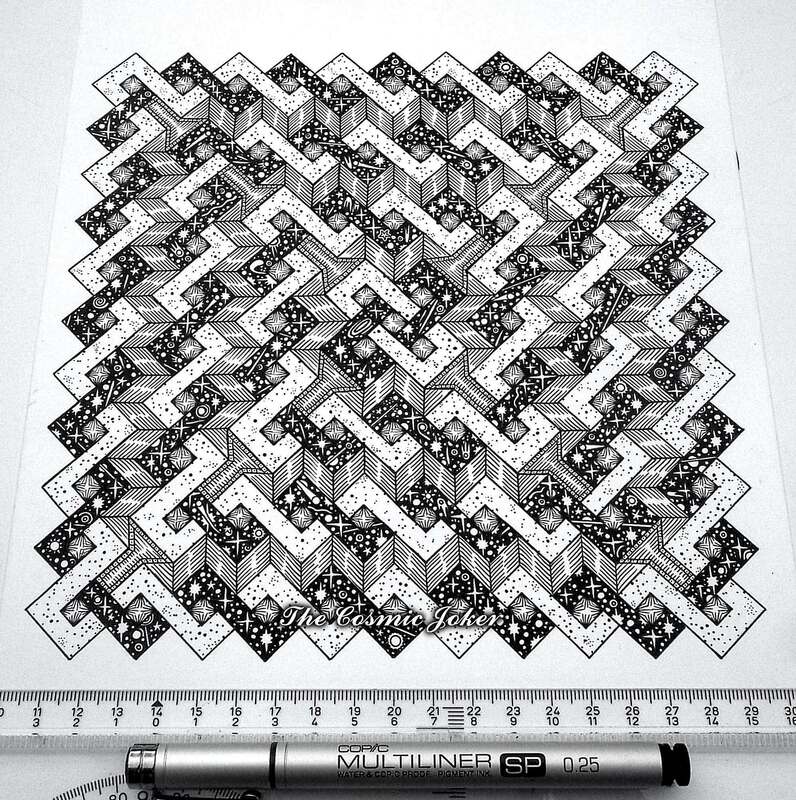 ‘Phi’ measuring 374mm X 230mm. Started in September 2016 and finished October 27 2016. The whole image is a golden rectangle. The main rectangle in the middle is also golden as are the two connecting rectangles at 12 o’clock and 6 oclock. I arranged the Fibonacci spiral the way it is as to me it always resembles a feminine face looking back at the viewer. If you notice the little teeth/cogs on the spiral as it goes into the centre, this also adds to the feminine energy giving it the effect of eyelashes. The spiral actually goes into the centre of the Orion nebula in the space I have created which is where our sun was born. There is a real but almost invisible spiral of gas that comes from this region called ‘barnards loop’ which spirals out to the stars that were created in this region of space. The background to the region of space within the centre rectangle (the dots and dashes) could on one level represent the digital nature behind reality or all the information within it. I have 24 suns/seeds of life, all uniquely decorated, around the border to represent on one level the cycle of a day.(24hrs). On another level the ancient yuga cycle of higher and lower ages every 24,000 years. The top and bottom golden rectangles are decorated with the Sun/PHI symbols. The Yuga cycle is also incorporated into the shading of the lower Sun. I left the upper sun shaded as it is to represent a golden age. The corner stones of the picture are megalithic blocks making up the Fibonacci progressions. I’ve been meaning to draw this exact picture for a couple of years now. Seeing how I am stuck in bed recuperating from an operation, I thought I would get it out of my head. Update: So I’ve finished the picture above, it was worthy of finishing. 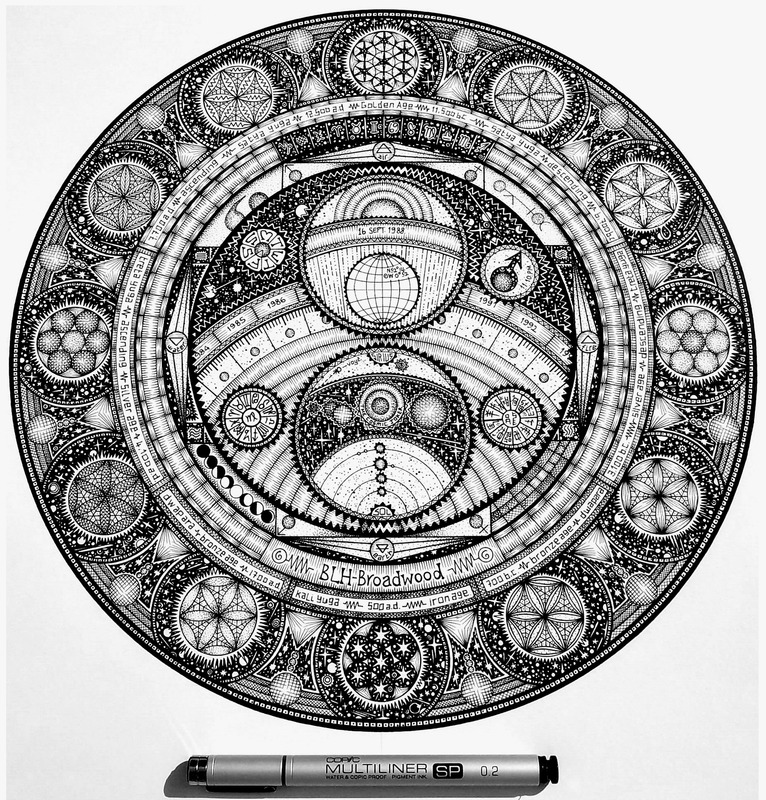 The black and white space spiralling around the border symbolises the concept of twin universes, (universes being born in pairs) one physical, the other non physical, wrapped around and within one another. The ancient symbols at the top centre represent a possible way of communication between a material and non material universes. The dots and dashes behind them showing that information is being transmitted , not just pretty symbols. The Symbols bottom centre are Egyptian hieroglyphics for the word “hept”, which means ‘to embrace’. 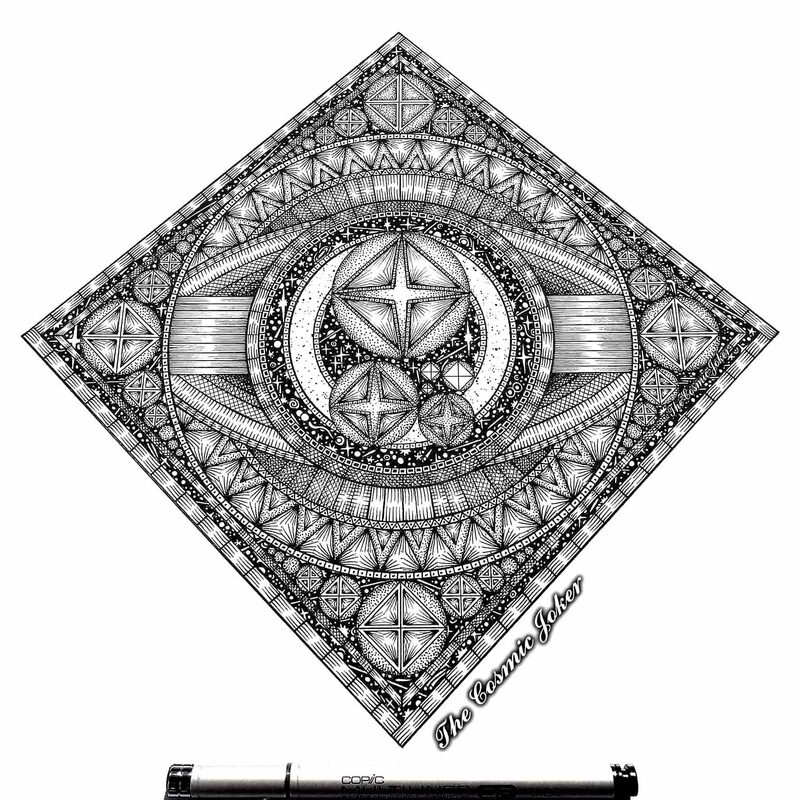 A square and a hemi sphere surrounded by a pair of outstretched arms. But symbolically read can mean the embrace of the physical and non physical. The corner stones again are Egyptian symbols for wind-fire-earth and water through which a material universe emerges. So the reason I connected the Hatman to this ancient concept is only because I don’t know not what was standing in my room that time. Perhaps these non physical beings come from a non physical universe wrapped all around and within us.